The image of a dark core encircled by a flame-orange halo of white-hot plasma looks like any number of artists’ renderings over the last 30 years. But this time, it’s the real deal. “The history of science will be divided into the time before the image, and the time after the image,” said Michael Kramer, director at the Max Planck Institute for Radio Astronomy. “It’s a distance that we could have barely imagined,” Frederic Gueth, an astronomer at France’s National Centre for Scientific Research and co-author of studies detailing the findings, told AFP. Locking down an image of M87’s supermassive black hole at such distance is comparable to photographing a pebble on the Moon, the scientists said. “Instead of constructing a giant telescope that would collapse under its own weight, we combined many observatories,” Michael Bremer, an astronomer at the Institute for Millimetric Radio Astronomy in Grenoble, told AFP. Knitted together, they formed a virtual observatory some 12,000 kilometres across—roughly the diameter of Earth. 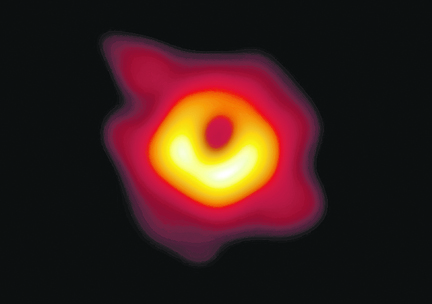 In the end, M87 was more photogenic. Like a fidgety child, Sag A* was too “active” to capture a clear picture, the scientists said. “What we see in the image is the shadow of the black hole’s rim—known as the event horizon, or the point of no return—set against the luminous accretion disk,” Gueth told AFP. The unprecedented image—so often imagined in science and science fiction—has been analysed in six studies co-authored by 200 experts from 60-odd institutions and published Wednesday in Astrophysical Journal Letters. Coined in the mid-60s by US physicist John Archibald Wheeler, the term “black hole” refers to a point in space where matter is so compressed as to create a gravity field from which even light cannot escape. “For everything to work, we needed to have clear visibility at every (telescope) location worldwide”, said IRAM scientist Pablo Torne, recalling collective tension, fatigue and, finally, relief. Torne was at the controls of the Pico Veleta telescope in Spain’s Sierra Madre mountains. The Universe is filled with electromagnetic “noise”, and there was no guarantee M87’s faint signals could be extracted from a mountain of data so voluminous it could not be delivered via the Internet. “We were desperately waiting for the data from the South Pole Telescope, which—due to extreme weather conditions during the southern hemisphere winter—didn’t arrive until six months later,” recalled Helger Rottmann from the Max Planck Institute. It arrived, to be precise, on Dec. 23, 2017. “When, a few hours later, we saw that everything was there, it was one hell of a Christmas present,” Rottmann said. “To be absolutely sure, we did the work four times with four different teams,” said Gueth. “We are looking at a region we have never looked at before, that we cannot really imagine being there,” said Heino Falcke, chair of the EHT Science Council.